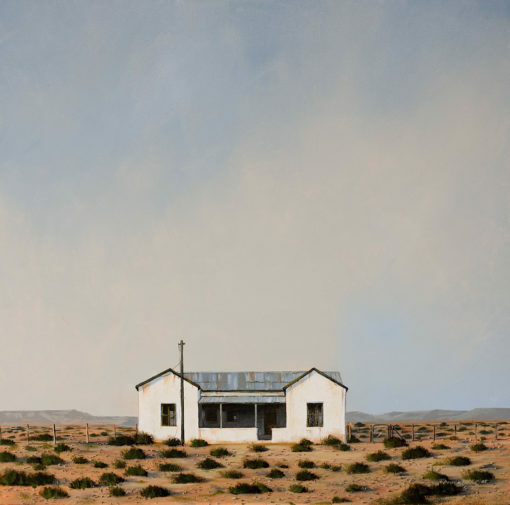 A lonely deserted farm house sits on an arid and vast lansdcape in the Karoo. 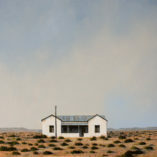 Donna loves symmetry and often places her focal point in the centre of her canvas, and in this case, drawing ones attention straight into the building, leaving one wondering who lived there and when and why had they left this solid and charming farm house. The Karoo is a semi-desert of South Africa. The Karoo is partly defined by its landscape, geology, and climate — above all, its low rainfall, arid air, cloudless skies, and extremes of heat and cold. The Karoo also hosted a well-preserved eco-system which is now represented by many fossils. The Karoo formed an almost solid barrier to the interior from Cape Town, and the early explorers and hunters on the way to the Highveld denounced it as a fearsome place of great heat, great frosts, great floods and great droughts. Today it is still a place of great heat and frosts, and an yearly rainfall of between 50–250 mm, though on some of the mountains it can be 250–500 mm higher than on the plains. However, underground water is found throughout the Karoo, which can be tapped by boreholes, making sheep farming possible.